A thunderstorm is defined as a storm that has lightning and thunder. Worldwide there are over 40,000 thunderstorms everyday with the United States alone having 100,000 thunderstorms yearly. The essential ingredients for a thunderstorm are warm, moist, unstable air that is forced to rise up either by convection, convergence, orographic uplift, or weather fronts. 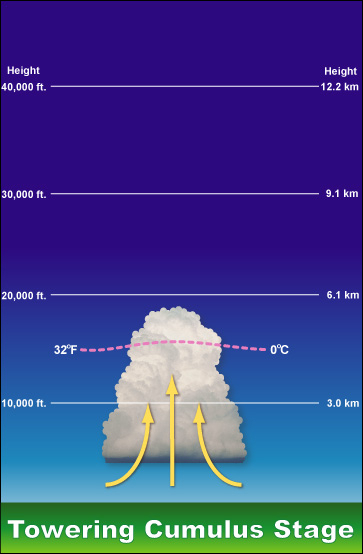 The rising parcel of air condenses into various types of cumulus clouds. The image on the right from the National Weather Service (NWS) shows how many days a year the region has thunderstorms. All thunderstorms go through a three-stage lifecycle. 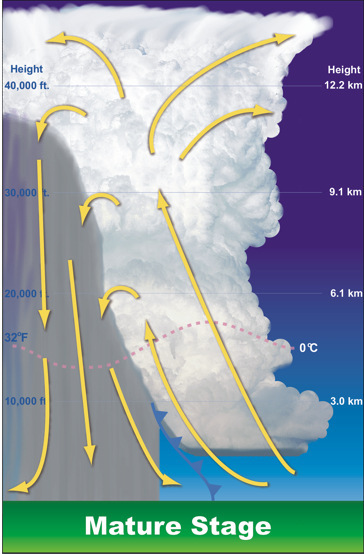 The first stage is called the cumulus stage, where an air parcel is forced to rise, cool, and condense, called the lower condensation level, to develop into a cumulus cloud. The process of water vapor condensing into liquid water releases large quantities of latent heat, which makes the air within the cloud warmer, and unstable causing the cloud continues to grow upward like a hot air balloon. These rising air parcels, called updrafts, prevent precipitation from falling from the cloud. But once the precipitation becomes too heavy for the updrafts to hold up, the moisture begins to fall creating downdrafts within the cloud. The downdrafts also begin to pull cold, dry air from outside the cloud toward the ground in a process called entrainment. There is a variety of thunderstorms; all with defined characteristics. Air mass thunderstorms, sometimes called ordinary thunderstorms, go through the defined lifecycle sequence mentioned earlier. As the word implies, air mass thunderstorms occur when a warm, moist (mT) mass of air from a source region such as the Gulf of Mexico migrates over land like the Great Plains. But rather than a large-scale storm system forcing the mT air mass upward, localized uplift such as convection, sea-breezes, or orographic uplift forces the moist air within the air mass upward. Most thunderstorms can also create other thunderstorms when downdrafts within a thunderstorm slam the ground and spread outward in an arc-shape. These rippling waves are called outflow boundaries or gust fronts because the cold air from the downdrafts acts like a mini-cold front. These mini-cold fronts can force warm air upward to generate new thunderstorms with cumulus development. If you were standing on this beach, you would be in the warm air mass, and the gust front would be coming toward you along with the cold air from the downdrafts of the thunderstorm many miles away. On average, ordinary thunderstorms last about an hour. But ultimately, because of these outflow boundaries, you can have many thunderstorms in different stages of development as one creates the other. These complex systems of thunderstorms can last several hours and are usually called multi-cell thunderstorms. The Storm Prediction Center classifies a thunderstorm as severe if it has winds that exceed 58 miles per hour or produces hail with a diameter of 1.9 centimeters. Of the 100,000 thunderstorms that develop within the United States experiences every year, about ten percent (10,000 storms) become severe thunderstorms. These can include air mass thunderstorms, squall lines, dryline thunderstorms, and supercells. Severe thunderstorms go through the same stages as air mass thunderstorms, but with one significant difference; severe thunderstorms last much longer in the mature stage. Ordinary thunderstorms do not last much longer than an hour because the downdrafts begin to cut off the updrafts. But severe thunderstorms have vertical wind shear at different levels that keep the storm in the mature stage longer. 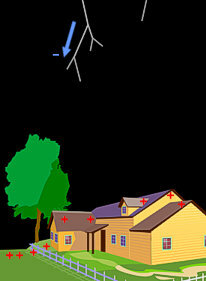 This occurs when fast upper level winds - such as the jet stream - causes the updrafts to be pull away from the downdrafts. This prevents the downdrafts from cutting off the updrafts. Severe thunderstorms are capable of producing beautiful mammatus clouds, heavy downpours, flash flooding, large hail, lightning, and straight-line winds. Squall lines are thunderstorms that develop linearly over hundreds of miles along the leading edge of outflow boundaries and are called gust fronts. Though these massive storm systems are quite powerful, they do not tend to produce tornadoes. Rather, straight-line winds and precipitation form because of the powerful, horizontal movement of the gust front. A squall line can also form along a boundary called a dryline. Recall from the discussion on mid-latitude cyclones that the warm air in front of the cold front is usually a mT air mass. Well sometimes a dry, warm cT air mass can penetrate between the mT air mass and cP air mass. Now dry air is actually heavier than moist air, so when it infiltrates a storm system it can cause the mT air mass to rise much like a cold front without the cold. The hallmark of a dryline is that the moisture within the air dramatically drops following the boundary. Drylines have the ability to produce severe thunderstorms that are often times more powerful than the cold front behind it. Below is an image of a dryline that formed on March 23, 2008 at 4:00 PM. The dryline is the brown/tan line with half-circles just in front of the cold front. This indicates a cT air mass from Mexico was migrating into a cold front that gave Salt Lake City 2 inches of snow. The other brown circle indicates the region for possible severe thunderstorms. There was also concerns of possible tornadoes along the dryline. You can read the report by the Storm Predication Center by clicking here. The most powerful type of thunderstorm is a supercell, which oddly enough is a single-cell thunderstorm on steroids. The United States alone has anywhere from 2,000 to 3,000 supercells a year. Supercells consist of a single powerful thunderstorm that can last several hours and grow to a heigth of 65,000 feet and last several hours in the mature stage with winds reaching over 100 mph and form the majority of all tornadoes. Just like severe thunderstorms, supercells may have upper-level winds which can pull the updrafts away from the downdrafts. Wind shear between the upper-level, mid-level, and surface winds can also cause the air beneath a forming supercell to rotate. For example, if you have upper-level and mid-level winds flowing from the northwest and low-level, warm southern surface winds converging together, a corkscrew flow of air could develop. This rotating column of air then gets picked up by the thunderstorm's updrafts causing the entire storm to rotate vertically – called a mesocyclone. 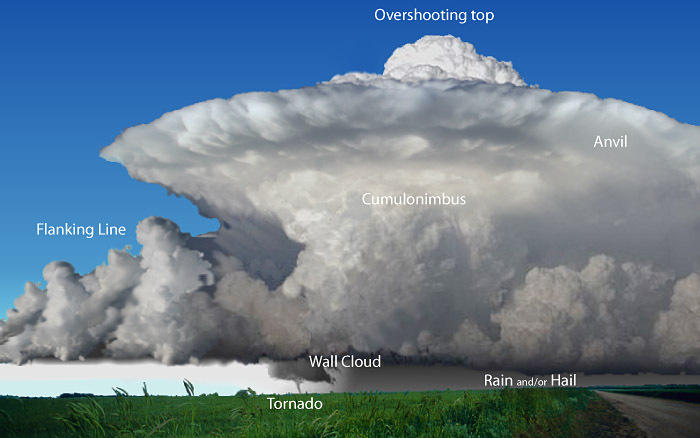 Now sometimes the rotating portion of the supercell - the mesocyclone - can extend below the base of the thunderstorm creating a cloud feature meteorologists called a wall cloud. 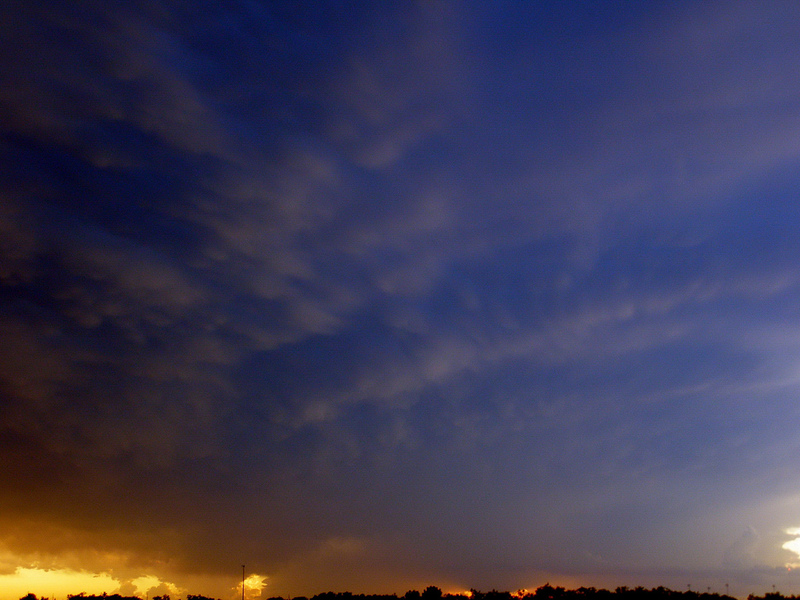 Lighting is how the atmosphere balances out the buildup of opposite electrical charges within a cumulonimbus. The buildup occurs when charged atmospheric particles become segregated between a cloud and the ground, between clouds, or from a cloud and surrounding atmosphere. The reason for charged particle separation is unclear to scientists, but some believe that ice crystals called graupel and supercooled raindrops interact with each other through collision creating positive and negative charges that get separated within the cloud by updrafts and downdrafts. Others believe that ice pellet formation within the cloud charges the particles. As an ice pellet forms, the outer shell freezes first and becomes positively charged and the liquid inner core is negatively charged. As the interior begins to freeze and expand, it breaks apart the positively charged outer layers. These positively charged fragments are taken into the upper regions of the cloud giving the top of the cloud a positive charge. The heavier liquid water has a negative charge and are at the base of the cloud. The image above from the National Weather Service is a map of lightning strikes, called flash rates, annually around the world. Where are lightning strikes greatest? Where are they the fewest? Can you explain why? Once charged particles are separated, an electrical attraction exists between the negative and positive charges (think of it like two magnets attracted to each other). The air between the oppositely charged particles tries to keep them separated. But when the air can not keep the two opposite charges separated any longer, the negative charges move towards the positive charge in a zigzag manner called a stepped leader. As the stepped leader approaches the ground, the positive charges on the surface will rise toward the steeped leader. It may rise up through trees, buildings, or humans. When the steeped leader and the rising positively charged particles connect, the negatively charged particles flow from the cloud to the ground. At the same time, an electrical discharge called a return stroke, flows from the ground toward the cloud along the same path as the stepped leader. The return stroke is the part you see as lightning. When you see the lightning flicker, it is because this process is repeating itself along the same path. 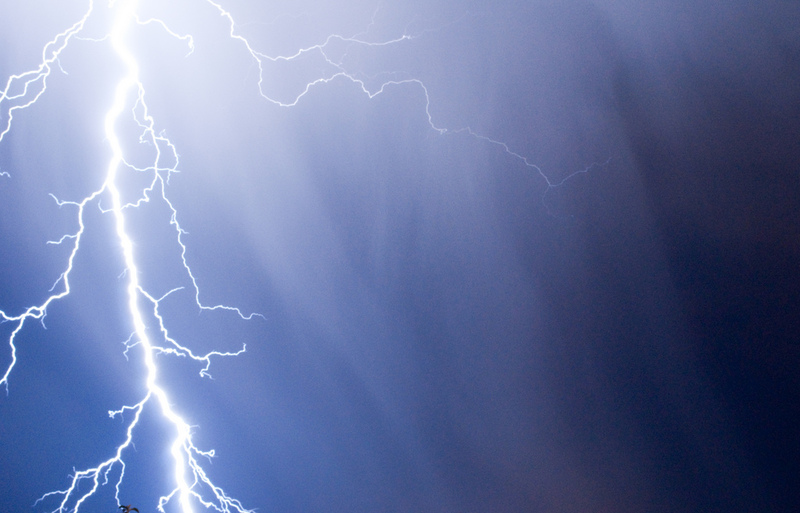 Eighty percent of all lightning strikes occur cloud-to-cloud, but this process mentioned above can occur with cloud-to-ground, cloud-to-cloud, and cloud-to-air. Lightning is only a few centimeters thick, but travels at 60,000 mph with a temperature of 54,000 degrees F (five times hotter than the surface of the sun). Lightning causes the surrounding air to become superheated, causing the air to expand violently, creating a shockwave called thunder. To estimate how far you are from lightning, count the number of seconds between the flash of lightning and when you hear the thunder reach you, then divide by five. But if the lightning strike is more than 12 miles away, thunder won't be heard. 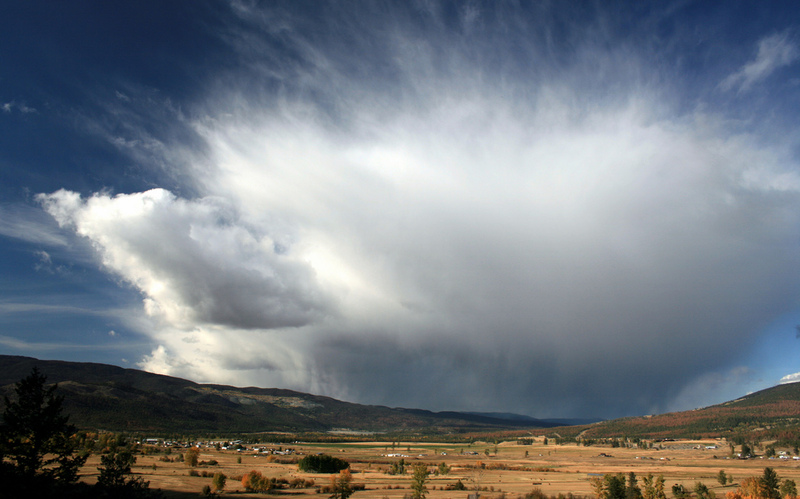 In the summer time, convection and/or orographic uplift can create dry thunderstorms. Dry thunderstorms typically mean storms that have lightning, but little to no precipitation falling. Often times this occurs when thunderstorms develop in dry atmospheric conditions. Because the air is so dry, rising eddies of moisture must reach great heights before being able to condense. This creates thunderstorms with very high cloud bases. 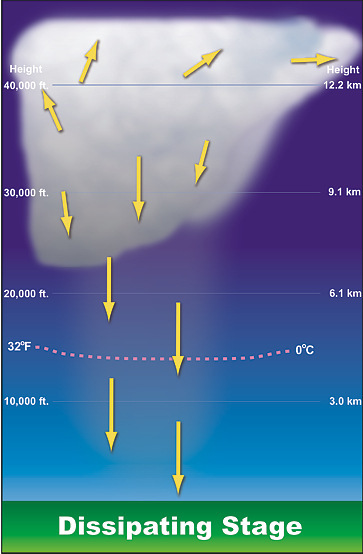 Any precipitation that does fall in these dry atmospheric conditions is likely to evaporate before reaching the ground. Thus these thunderstorms can create lighting, which can cause ignite wildfires and the evaporating precipitation can produce strong, dry winds that can "push" the fires around. Hail is precipitation in the form of ice pellets that only forms in cumulonimbus clouds where the lower region of the cloud contains liquid water and the upper region containing ice freezing. When an ice pellet falls within the cumulonimbus cloud, it enters the warm, liquid region and picks up moisture. Then the updrafts through the ice pellet back up above the freezing point hardening the newly gathered water. The ice pellet will fall again to collect liquid water and thrown back up to refreeze. This process will continue until the weight of the hail stone becomes too heavy for the updrafts to hold it up. Once the hail becomes too heavy, the hail will precipitate on the downdraft side of the cumulonimbus. The number one weather related cause of death in the United States are flash floods. The National Weather Service states that "flash floods are short-term events, occurring within 6 hours of the causative event (heavy rain, dam break, levee failure, rapid, snowmelt and ice jams) and often within 2 hours of the start of high intensity rainfall. A flash flood is characterized by a rapid stream rise with depths of water that can reach well above the banks of the creek. Flash flood damage and most fatalities tend to occur in areas immediately adjacent to a stream or arroyo. Additionally, heavy rain falling on steep terrain can weaken soil and cause mud slides, damaging homes, roads and property." 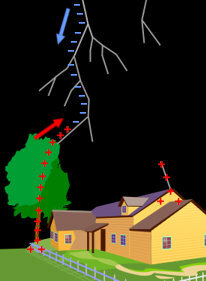 One weather related hazard are downbursts and microbursts. Sometimes the moisture within downdrafts falling from the thunderstorm evaporates as it enters dryer air below the cloud. As the moisture evaporates, the air cools because of latent heat, causing the air to become denser. This in turn causes the air to fall faster. As this denser air hits the ground, it spreads out laterally producing cold winds reaching 100 miles per hour. 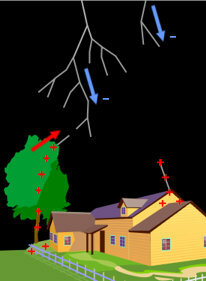 Microbursts can uproot trees, damage property, and are very dangerous for airplanes taking off or landing. Winds, crosswinds, and microbursts are all major concerns for aviation pilots, especially when you are traveling 200 mph and are only 100-500 feet from the ground below. Interestingly enough, because of the world of technology, many of these near-crashes have been captured on video from all around the world. Below is a video on some of the best landings ever done by pilots fighting crosswinds and microbursts. In fact, it is pretty much an extension of a supercell's mesocyclone. They range in size from 300 feet to over two miles wide, last minutes to hours, travel a few miles to over 250 miles, at speeds of 30-65 mph. About 75 percent of all the tornadoes in the world occur in the United States; in fact the United States has more tornadoes than the rest of the world combined. What makes tornadoes so destructive are the wind speeds within them. Atmospheric pressure within a tornado can be 10 percent lower than the air surrounding the tornado, causing air to flow into the tornado from all directions. As the air flows into and up a tornado, the moisture begins to cool and condense into a cloud allowing the tornado to be seen. Debris picked up by the tornado will also cause it to darken. National Geographic has a great interactive website on tornadoes called Forces of Nature. I highly recommend that you check out this website! The anatomy and development of tornadoes is not fully understood, but they do form from cold fronts, severe thunderstorms, squall lines, supercells, and hurricanes. Geography also plays a key role in determining where tornadoes can and can not form. The majority of thunderstorms in the United States form in the Midwest, called Tornado Alley, where cP air masses from Canada collide with mT air from the Gulf of Mexico, creating unstable atmospheric conditions. This wind shear creates a rotating corkscrew column of air. As the ground heats up through the day, updrafts pick up the rotating air into a portion of the thunderstorm to developing what is called a rotating mesocyclone. The updrafts stretch and tighten the now vertical column of air causing it to rotate faster much like an ice skater tightens to spin faster. 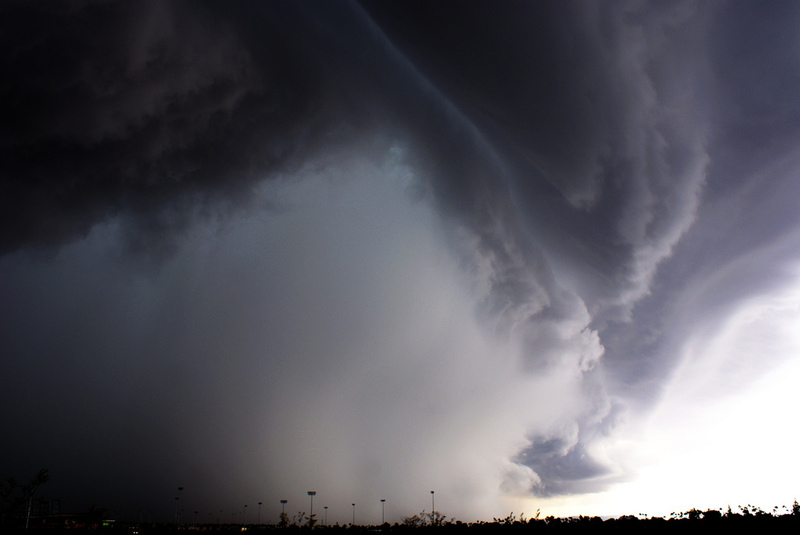 As the rotating updrafts rise, a rotating wall cloud begins to form from the base of a mesocyclone. Sometimes a funnel cloud may begin to descend from the mesocyclone and may even be called a tornado if it reaches the ground. Since 1990, the United States have averaged 1,200 tornadoes reported every year. But the exact number per year can vary. Because the contrast between cold polar air and warm subtropical air is greatest in the spring and fall, the majority of tornadoes in the United States develop during those seasons with April through June being the greatest. The original way tornadoes were classified was based on a scale system developed by Dr. Fujita, which became called the Fujita Intensity Scale or simply the F-scale. The Storm Prediction Center states that the goal of the Fujita Intensity Scale was to "categorize each tornado by its intensity and its area and estimate a wind speed associated with the damage caused by the tornado." The scale ranged from weak F0s to rare and obliterating F5s. In February 2007, a new classification system began called the Enhanced Fujita Scale. The scale still ranges from 0-5 and is still an estimate of the tornado's wind speeds, but is an enhancement from the former system because of the focus on "consistent assessment of damage, which includes enhance descriptions of damage with examples and photos include not only structures, but also vegetation base damage assignment on more than one structure, if available develop a PC-based expert system develop training materials and data collection by maintaining current tornado database surveys should include additional data mean and maximum damage path width basis for damage assignment latitude/longitude of where the path began and ended number of hours spent on the damage survey names of survey team member(s)." Any tornado that formed as of February 2007 will have the EF classification, but all previous tornadoes will maintain the old F-scale. The majority of deaths caused by a tornado are not caused by wind, but by the flying debris. 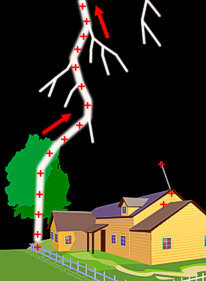 Sometimes a tornado will pass through a neighborhood and destroy some houses while leaving others with little damage. Scientists have discovered that some large, intense tornadoes might contain several smaller tornadoes within them called suction vorticies that make up what are called multiple vortex tornadoes. A lot of time, money and research has gone into understanding tornadoes in order to provide better warnings to the public. When the atmospheric conditions are right, the Storm Prediction Center (SPC), which is part of the National Weather Service, analyzes severe weather and posts their forecasts to alert the pubic. If the conditions are right for a tornado to form, the SPC will send out a tornado watch alerting the public of the possibility of a tornado in a given area within a specific time. When a tornado has been cited, the National Weather Service will send a tornado warning out. A tornado warning warns of a "high probability of imminent danger" to a specific location. Doppler radar has become vital in not only determining the location and intensity of precipitation but in locating where mesocyclones and tornadoes may be forming. Doppler radar can do this by monitoring the flow of wind toward or away from the tower, called the Doppler effect. Click here to view an image of an EF5 tornado approaches the Doppler. Notice a hook echo form in the red and begin rotating counter-clockwise, like most low pressure systems do in the Northern Hemisphere. Weather satellites have also become instrumental in weather forecasting and monitoring. Ever since the movie Twister came out in 1996, there has been a lot of publicity and entertainment with the idea of storm chasing. Discovery Channel had a popular television series called Storm Chasers that ended in 2012. But there is a lot of science involved with storm chasers and many are scientists seeking scientific data for better forecasting and warning systems. The largest group of scientists who monitor tornadoes is called Vortex2, which is funded by the National Science Foundation (NSF) and the National Oceanic and Atmospheric Administration (NOAA). 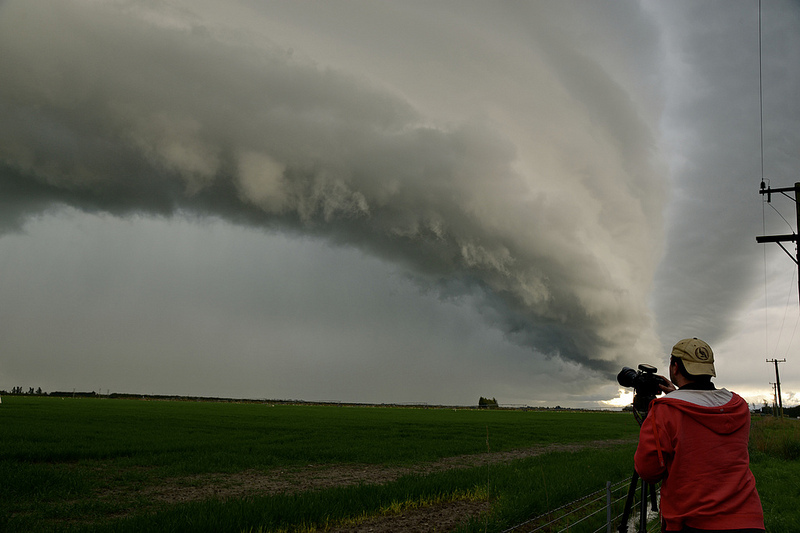 For a series of storm chasing videos, click here.